The blooms are a bit sparse right now: the cool spring has delayed things like the hydrangeas and swamp marsh phlox. 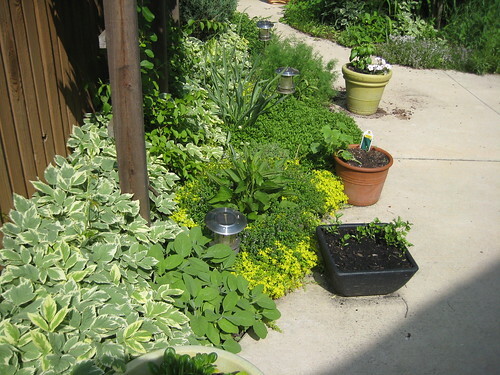 Nevertheless, there are things blooming…..
….like thyme and a mystery yellow-flowered groundcover inherited from the previous homeowner. Any ideas about what this could be? There are also many things setting fruit right now…. 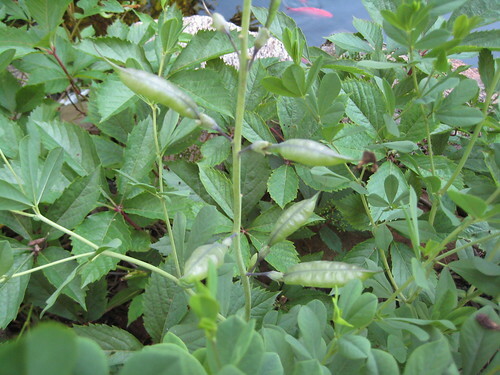 ….like the Baptisia australis. I wonder if I should be deadheading this? On the down side of things, the wild hyacinth looks about dead – it never bloomed this year. The strawberries are spreading everywhere, but don’t seem to be coughing up any fruits, darn it! But pretty much everything else is going great guns, if a week or two behind their normal schedule. 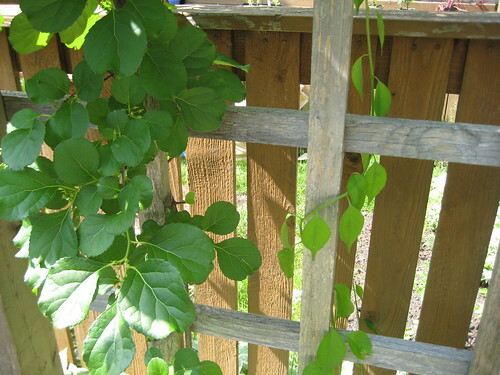 I was worried earlier about how long it would take for the new native bittersweet (Celastrus scandens) I planted last fall to cover the trellis. I’m pleasantly surprised to see how quickly the new stuff is growing! 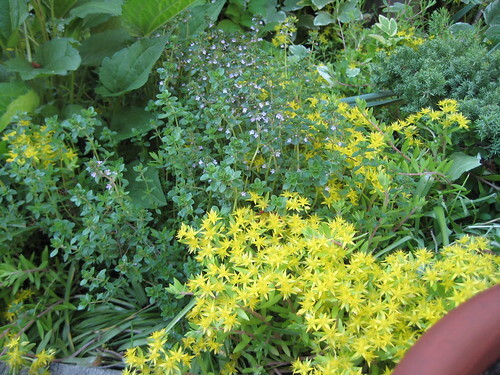 The older non-native (C. orbiculatus) plant is on the left, the native plant is on the right. With only a couple of months of growth, it’s over halfway up the trellis. 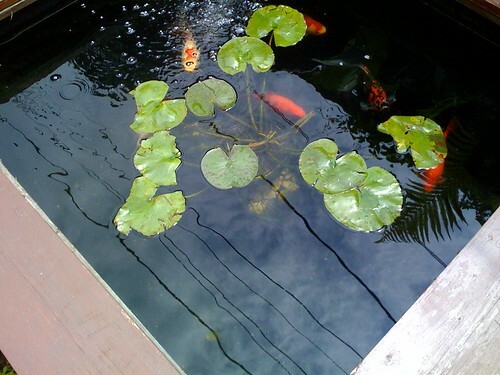 The folks at Moonshine Designs raised some very healthy plants! I’m continuing to cut back the invasive plant as much as possible, leaving just enough so the trellis doesn’t look barren. 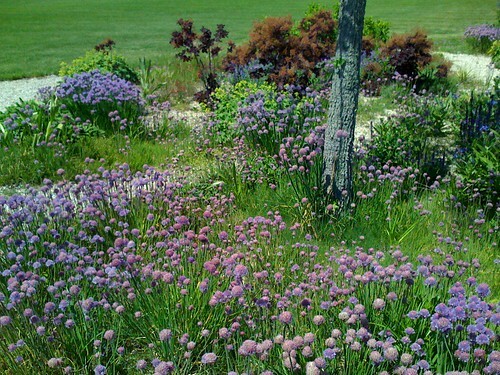 I’m hoping to have all of the orbiculatus out of here by the end of the year. 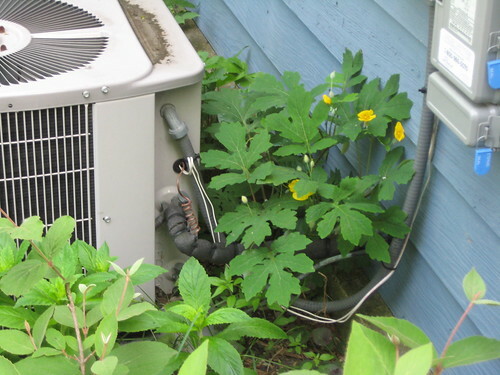 Do note that you can really tell the difference between the leaves of the invasive versus the native in the photo above. The invasive’s leaves are rounder, thicker, and glossier than the natives. There’s also a subtle difference in the distribution of the flowers. Update: The C. orbiculatus is gone! 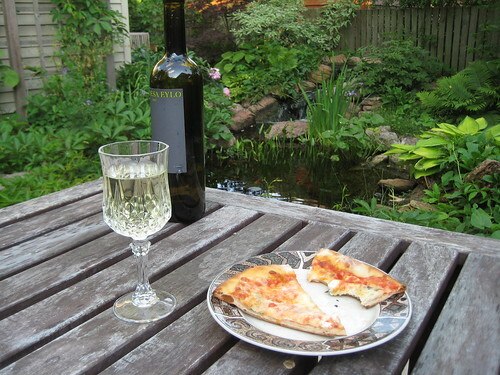 Summer has arrived in Chicago, so it’s finally time to start using the patio. 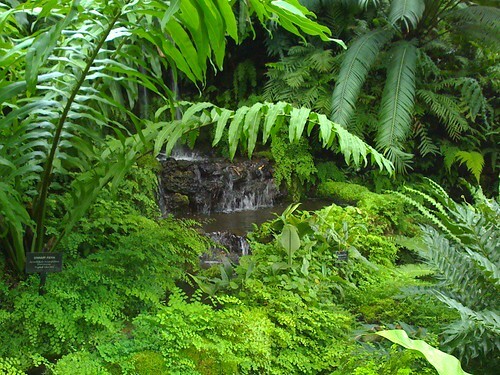 Nothing is quite as relaxing as sipping wine while listening to the waterfall. 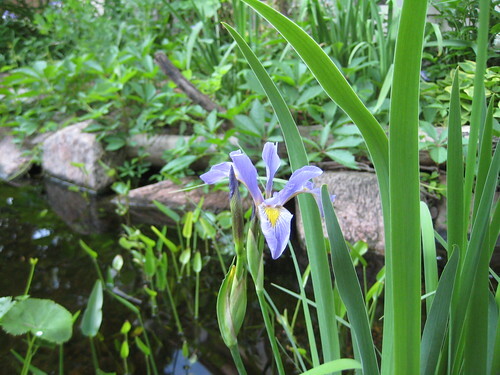 The wild irises (Iris shrevei) are blooming both in the pond and out of it. 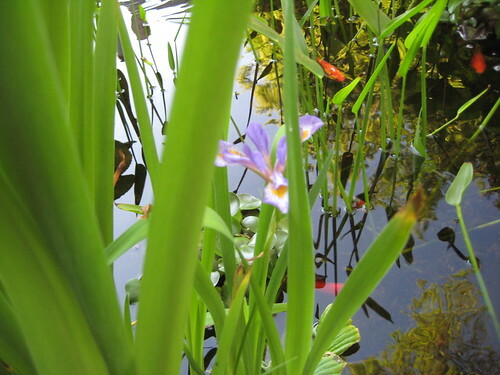 The pickerel weed (Pontederia cordata) is poking up above the water, and the lizard’s tail (Saururus cernuus) has spread over quite a bit of the pond. 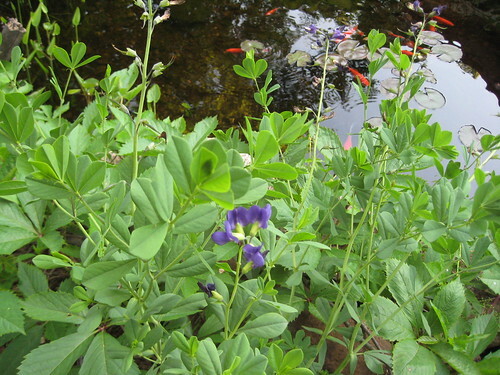 On the other side of the pond, the blue false indigo (Baptisia australis) is almost done blooming. 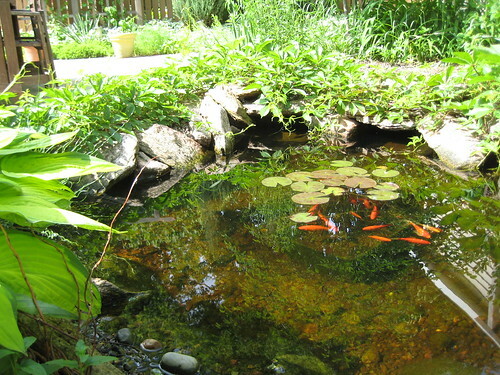 The goldfish have lost their springtime shyness, and are now begging for food every time a human wanders near the edge of the pond. 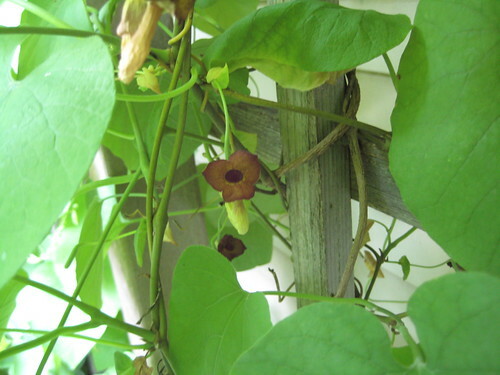 The Dutchman’s pipe (Aristolochia macrophylla) is still blooming, amazingly enough. 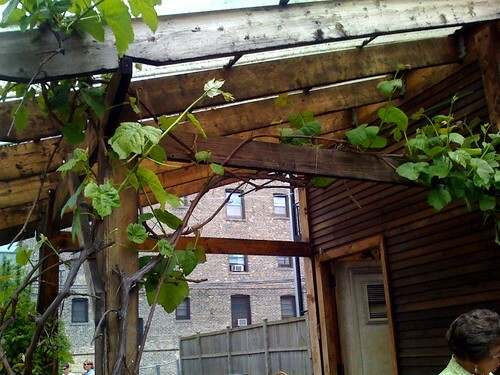 The vine is having a great year, and may take over the entire garage trellis.